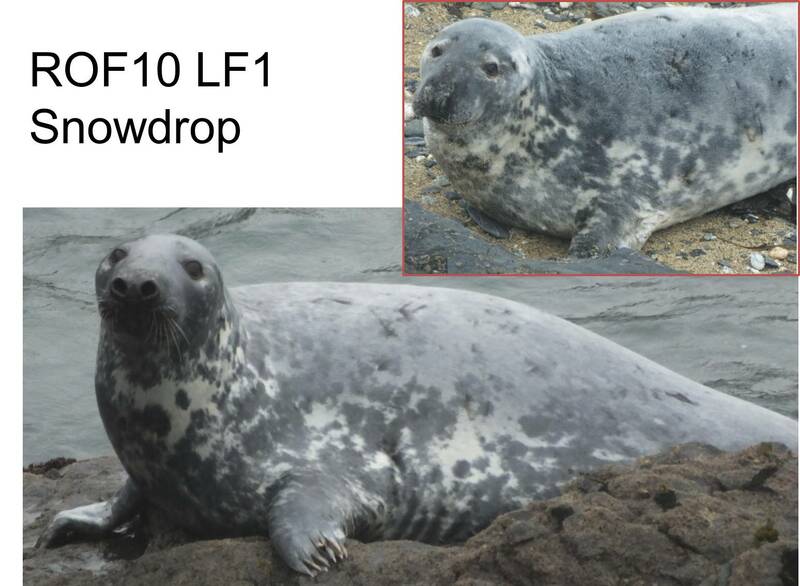 Rob Wells and Kath Wherry survey an important south coast seal site on the Roseland and their visit on 30th January began as always with a count and overview photo of the seals. 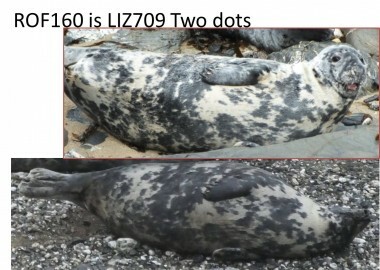 There were a good number of seals sleeping soundly on the beach and Kath and Rob spent the next few hours photographing them from three different positions on the clifftop to get as many different angles of the seal fur patterns as possible to maximise our chances of identifying the individuals. Their work paid off big time! On returning home, Rob scrutinises their photos against the Roseland seal identification catalogue to try and recognise the individual seals present. 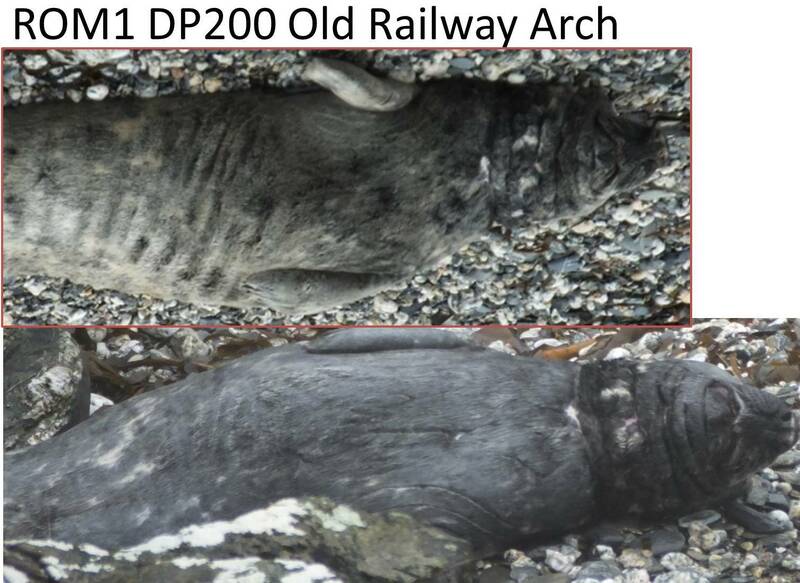 This would be a relatively straightforward process if seals stayed put at the same site all year. But they don’t! 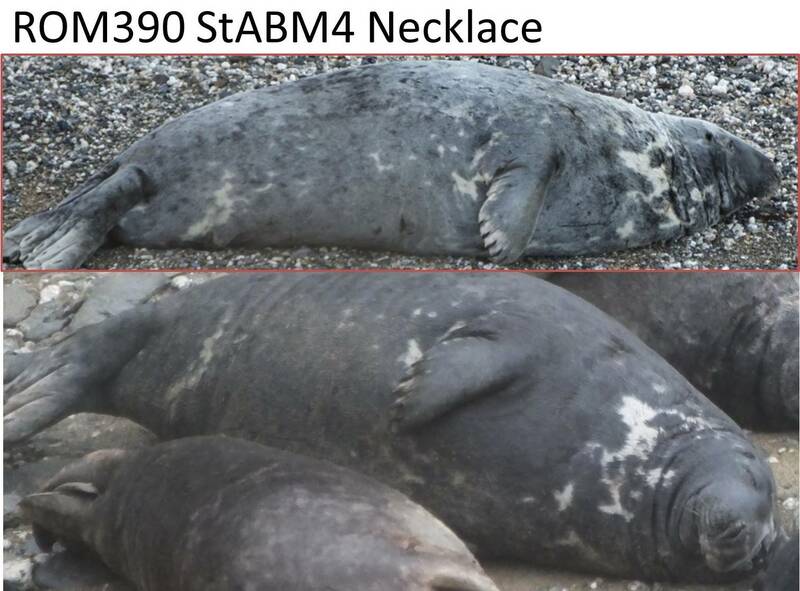 They regularly move through sites so you won’t find the same seals on the same beach throughout the year. Lots of seals were familiar to Rob though and he sent CSGRT a list of seals he knew. These were then added to by CSGRT’s ID coordinator Sue Sayer to process and confirm the identifications in a format that allows for retrospective independent verification. The results were fascinating. Incredibly the seals present on this single day linked the Roseland site to six other sites from Dorset to the east (1 seal), the Isles of Scilly to the west (1 seal) and Pentargon on the north Cornish coast (1 seal). 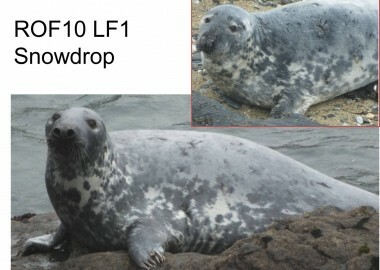 Five seals had previously been identified on the Lizard, five in St Austell Bay and another adult female – Snowdrop – had last been identified off Looe. 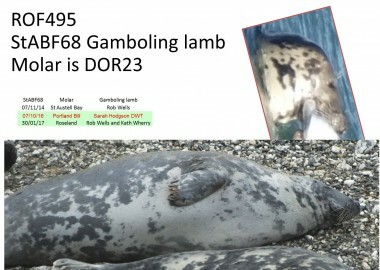 A real highlight for Rob was the return of his wandering seal – Gamboling lamb! Rob first saw this beautiful adult female offshore at his other survey site in St Austell Bay back in 2014. Then she disappeared off our radar until she surprised us all by turning up in a photograph taken by Sarah Hodgson on 07/10/16 off Portland Bill in Dorset. As the first photo identification link between Cornwall and Dorset Gamboling lamb made such a splash that we featured her in a webstory! So now she is back in Cornwall this time a little further west than she started! And, we are left wondering – where will she wander next? Next to Gamboling lamb was an equally exciting seal…Torch. 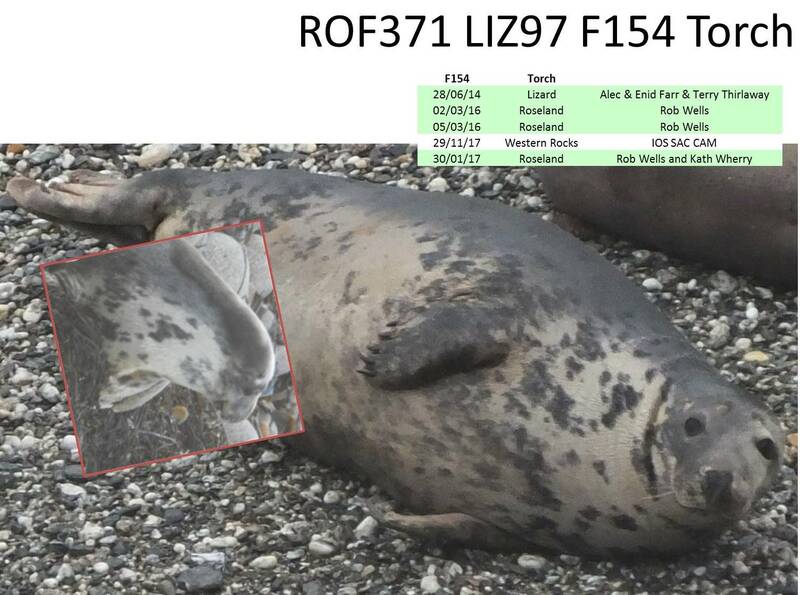 This adult female seal had first been identified off Lizard Point in 2014 before visiting the Roseland in March 2016. Last November she was photographed hauled out with her pup on the Western Rocks in the Isles of Scilly during CSGRT surveying work being carried out on behalf of Natural England. She has obviously recovered well from her pupping experience and has put on the weight she lost during her lactation period and looked fat and fit on the Roseland. Also keen to be recognised and posing for the camera on rocks just offshore was adult female Snowdrop. Snowdrop is known to visit the Roseland haul out routinely in the winter as a break from the site where she spends the rest of the year – Looe. She has been identified on the Roseland since 2011. Far less interested in his surroundings was Old Railway Arch. 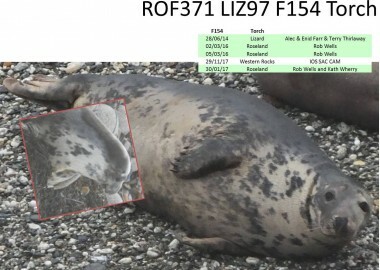 He is the reason CSGRT began surveying on the Roseland when local National Trust Ranger Phil White contacted us in 2009 to discuss an entangled seal he was concerned about. Sadly this adult male has been entangled since he was first added to our north coast catalogues in 2005. Removal of his entanglement would require surgery off the beach and he is just too big for us to move, so we have been unable to help him. He enjoys overwintering on the Roseland and we have only seen him at this site since 2015. 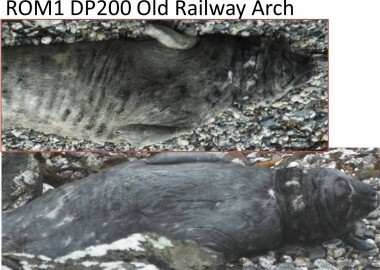 Two other sites the Roseland seals that day linked to were St Austell Bay and the Lizard. 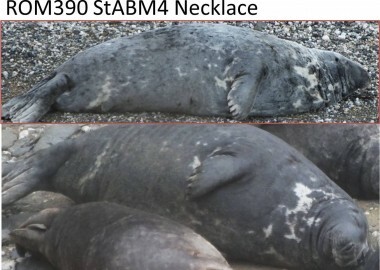 Adult male Necklace who has a beautiful white marking on the right side of his neck was one of the first seals Rob photographed back in 2014 at his other survey location further east along the south coast. 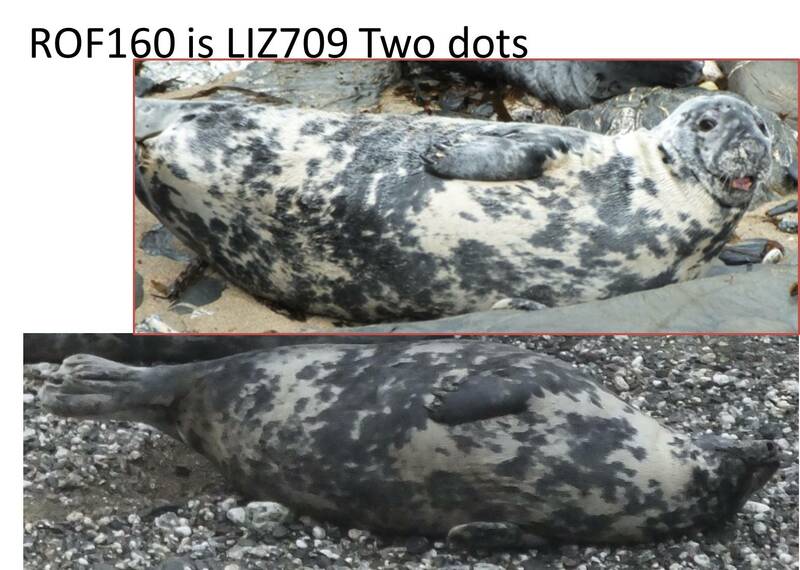 Charismatic female Two dots is a bit of a stunner in the seal world and she visited the Lizard back in Feb 2016. All our volunteers will need to keep a look out for these wanderers as they make their way to who knows where over the coming months! It will be exciting to see! Huge thanks to our network of amazing supporters to collaborate to jigsaw these seal stories together. Particular thanks to Rob and Kath for committing so much time, effort and energy into doing these surveys which take our learning forward about what seals are up to around our coast.